The Skinny: An incredibly engrossing crime film that thrills with its utter nihilism. Probably the most exhilarating ride out of Hong Kong this year. Continuing their streak, Milky Way Productions brings us this dark crime thriller that’s gripping, nihilistic, and very, very good. This is one of the blackest movies you’ll ever see, and it’s directed to near perfection by Patrick Yau (The Odd One Dies). 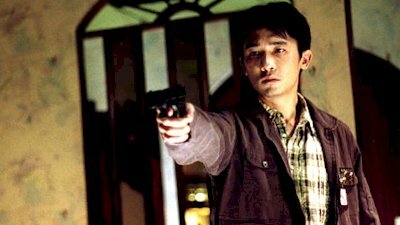 Tony Leung Chiu-Wai is Sam, a very bad cop who’s caught in a brewing gang war in Macau. He works for triad Brother K, who’s in negotiations with rival triad boss Lung to join forces after a long-running feud. The impetus for their union is the return of Mr. Hung, a legendary boss. However, the word on the street is that there’s a contract out on Lung’s life. Worse, the rumor mill maintains that it’s Brother K who’s offering the five million as the Um Fa (hidden reward) - which does nothing for gang peace. Sam is given the job of preventing any attack on Lung, thereby preserving the two gangs in their stance against Mr. Hung. However, on the fateful day of Lung’s arrival, a mysterious bald stranger (Lau Ching-Wan) walks into town with a bag slung over his shoulder. Then things get worse. Disturbingly violent, perfectly paced, and involving as hell, this picture is one of the purest genre films you’ll ever see and proof that Hong Kong can still make good movies. The plot twists are more plentiful than in L.A. Confidential, but they’re buoyed by a gripping narrative drive and an incredibly assured sense of style. Notes:  Though it won no Hong Kong Film Awards (movies of such nihilism rarely win awards), it was honored with nominations for Director, Screenplay, and Editing. Both Tony Leung Chiu-Wai and Lau Ching-Wan received nominations for acting.